I took this shot on the final day of the last Gary Hart workshop of the season. We’d taken the group to one of his favorite spots. It’s a similar perspective to the traditional Tunnel View but a bit off of the beaten trail. The anticipated star of the show that evening would be the full moon rising directly next to Half Dome. While we sat and waited we laughed and joked about the previous 4 days. Some folks did a little shooting but mostly it was a waiting and reflecting time. I had my 100-400 lens on because I wanted to revisit a shot that I’d taken 3 years prior (almost to the day). While waiting, I spotted this tree standing against the profile of El Capitan. Apparently I wasn’t the only one who’d noticed it because shortly after this shot Gary pointed it out to the group and I’m certain that mine wasn’t the only shot of this tree made that evening. “Big” is a common adjective when describing iconic views in Yosemite. The huge granite face of El Capitan is an imposing structure but the dark silhouette of this lone pine made an interesting contrast. The tree’s ridge had just dropped into shadow while the warm orange of the evening sun glowed on the granite behind it. Even with no camera, it would’ve been a great way to end the day. As a side note, this is another example of why you don’t want to leave a lens in the car. While many consider Yosemite to be a wide-angle location, there are a ton of intimate scenes, such as this, if you’re willing to go looking for them. 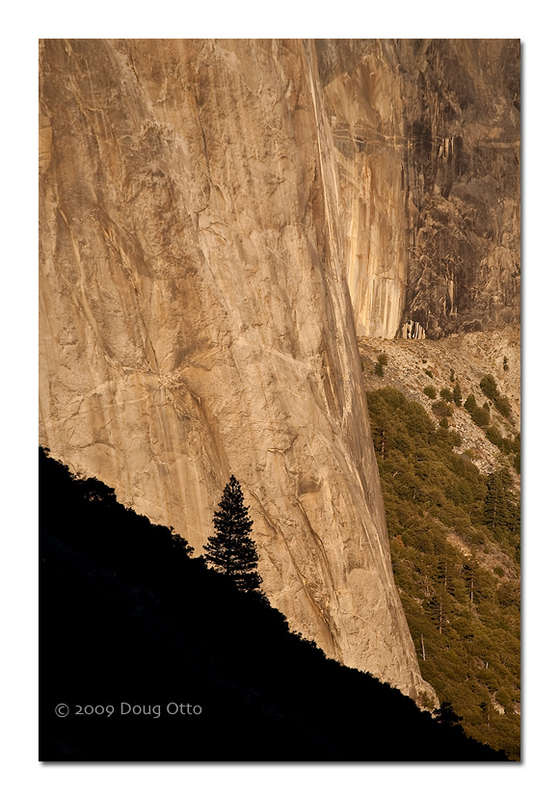 This entry was posted in Photography and tagged Canon 100-400, Canon 5D, doug otto, el capitan, yosemite national park. Bookmark the permalink.